I'm catching up a bit on Messenger news from the week(s), and this one is major! The Mac boys at Microsoft have finally announced audio/video features for the personal service of Messenger for Mac 7. They've implemented them a few months ago in the corporate version (made for Office Communications Server) but now it's coming to the personal client which works with Windows Live. Even better, it works across platforms so Messers on Mac and Windows systems will be able to have audio and video conversations with each other. The protocol is already included in the Windows Live Messenger 2009 client, so now the wait is on for the next Messenger for Mac release in 2009. Both the personal and corporate service will have other new features as well. If you're attending the Macworld expo in San Francisco (January 5-9, 2009), stop by the MacBU booth and ask for a live demo of A/V in the personal service of Messenger for Mac. And when you're at it, make a video and send it this way. 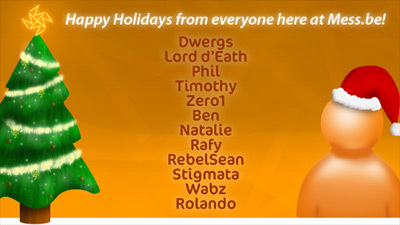 Thanks to Shoop for the Christmas card design! UPDATE: Of course, fellow team member Inky wishes you happy hols too!